Hillsboro senior Ethan Watson (12) attempts a jumper after spinning baseline in the second quarter Friday at Hillsboro High School where the Indians hosted the Ironmen in FAC varsity boys basketball action. Indians’ starting forward Brad Miller attempts a floater over three Jackson defenders on Friday at Hillsboro High School. Hillsboro beat the Ironmen by a final score of 54-45. 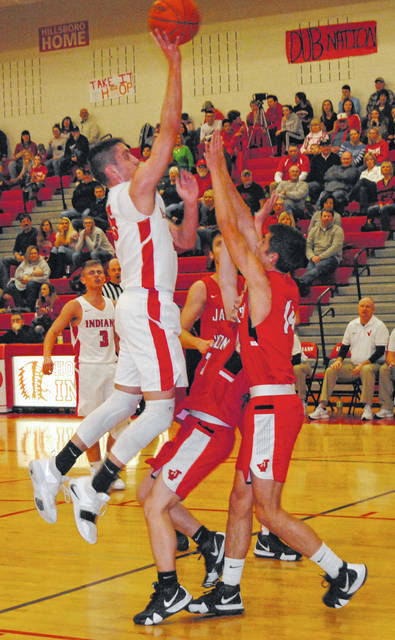 The Hillsboro Indians hosted the Jackson Ironmen on Friday at Hillsboro High School in Frontier Athletic Conference basketball action that saw Hillsboro beat the Ironmen by a final score of 54-45 to avenge its loss at Jackson on December 11, 2018 where they lost 69-33. Hillsboro quickly jumped out to an 8-0 lead and held the Ironmen scoreless until the 2:42 mark of the first quarter. Brad Miller recorded four points during the initial surge while Mason Swayne and Reece Bloomfield had two points apiece before Caden Donaldson found the bottom of the net for the Ironmen. Jackson finished the quarter on an 8-1 run with Hillsboro’s only points coming when Ethan Watson split a pair of shots at the free throw line. Hillsboro led 9-8 after one quarter. Treylan Davis and Caleb Wallis each had a basket within the first minute of the second quarter to take a 12-9 lead and force Hillboro Head Coach Bruce Miles to call a timeout with 7:19 to play in the second quarter. Ryan Scott broke the seal for the Indians in the second quarter at the 5:27 mark but Jackson responded with five straight points to push their lead to 17-11 with 3:55 left in the first half of play. The teams traded baskets to bring the score to 19-13 with under three minutes to play before Hillsboro closed the quarter with a 4-1 run and only trailed 20-17 as the teams made their way to the locker rooms. 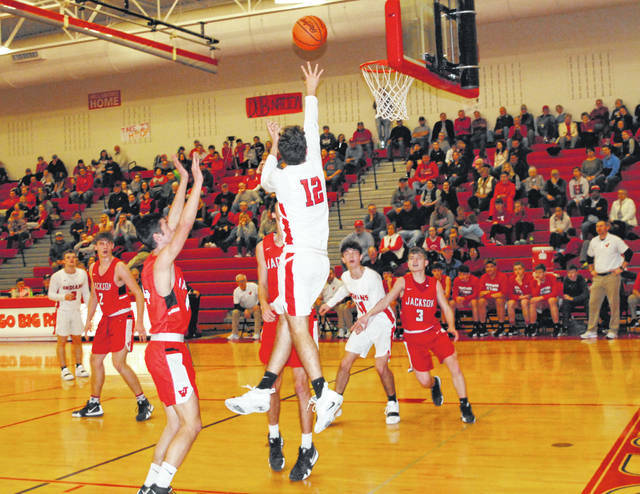 The Indians came alive in the third quarter and were led by Watson who totaled 12 points in the period and sank three triples as Hillslboro outscored Jackson 19-10 in the frame to take control. Gavin Temple recorded his only two points in the third while playing his usual stellar defense for the Indians. Scott added four points of his own and Miller split a pair of free throws to account for the Indians scoring in the quarter. Nevan Yates and Wallis were the lone scorers for Jackson in the third with each hitting a three pointer and Wallis adding four more points to keep the Ironmen in the game at 36-30 entering the fourth quarter. Hillsboro finished off the Ironmen in the fourth quarter as they went six of seven from the charity stripe and seniors Swayne and Watson combined for 14 points in the frame with six and eight points respectively. Scott added four points of his own in the quarter as the Indians held on for the hard fought 54-45 win. Hillsboro is scheduled to be back in action on Friday, January 25, when they host the Miami Trace Panthers in an FAC showdown. The Ironmen are scheduled to travel to Washington Court House to take on the Washington Blue Lions at Washington High School on Friday.